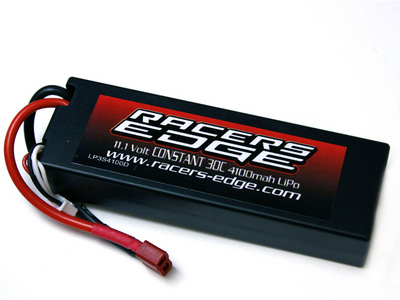 RCELP3S4100D - Racers Edge 11.1V 30C 4100 3S Lipo Battery HardWired w/Deans Ultra Plug. Racers Edge 30C 4100mAh 11.1volt 3S1P LI-Poly Battery hardwired with Deans plug.This hardcase 3s lipo battery offers superior voltage and long runtimes. The dimensions are 47mm wide, 138mm long, and 23.5mm tall, making it the perfect fit in any truck that fits standard size 2s lipo packs. It uses the same balancing connection as Align or Electrifly chargers, the JST-XH. Be sure to use a voltage cut off if your speed control doesn't come equipped with one, and be sure to use a lipo specific charger and Lipouch safe charging bag.